Mission San Buenaventura. Courtesy of Santa Barbara Mission Archive-Library. Founded on March 31, 1782, Mission San Buenaventura is ninth in the mission chain, last to be founded during Father Serra’s lifetime and one of six he personally dedicated. 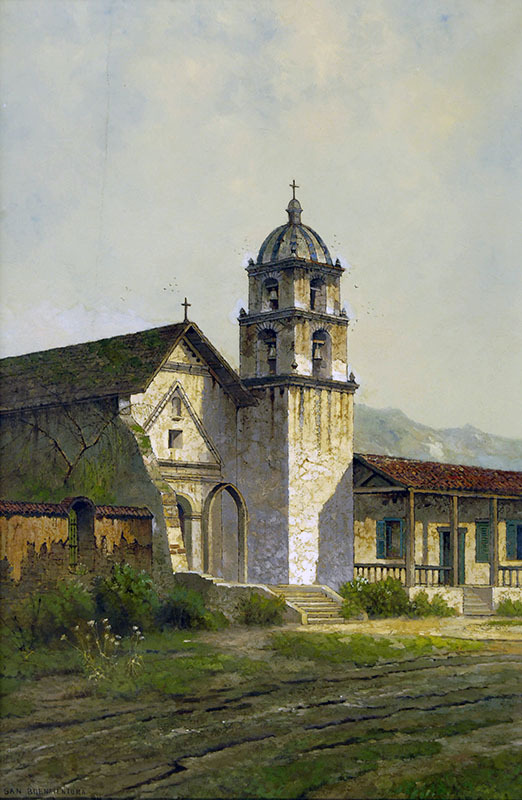 The mission was constructed as part of the Santa Barbara Channel section, which included missions at Santa Barbara and La Purísima, and El Presidio in Santa Barbara. The fathers, who already had three missions in the north and three in the southern part of California, feared an Indian revolt in the state’s midsection. They thought an Indian revolt could be devastating, because of the area’s terrain. The mountains of the Santa Barbara Channel zone gracefully slope downward to the ocean, leaving little room for passage. The missionaries feared that angry Indians could easily divide the state, limiting the Spaniards to communication by sea. The revolt never happened, and Mission San Buenaventura continued as a large agricultural producer. The Indians of the area were Chumash, who covered the area from Ventura northward to San Luis Obispo. The Chumash were the most advanced of all the mission tribes. Using canoes, such as this replica of the plank canoe, the Chumash often journeyed to the Santa Barbara Channel Islands, up to 65 miles from the mainland. The Chumash excelled at basket making, a measure frequently used by the Spaniards to judge the intelligence of an Indian tribe. The Indians used the baskets for cooking, trapping fish, and carrying water. Under the direction of Padre Cambon, natives constructed a seven-mile aqueduct that brought water from the Ventura River to this water filtration building. It was appropriately named el caballo, which means “horse” in Spanish, because the spout was said to have resembled a horse’s head. El caballo later inspired terror and scorn when it was converted into a jail. Unique to Mission San Buenaventura are these wooden bells. They were used during Holy Week, between Palm Sunday and Easter, while the metal bells were silent. While they are certainly originals, their origins are a mystery. After a series of earthquakes and an accompanying tidal wave in 1812, the church has been beautifully restored; it contains a 400 year-old crucifix from the Philippines. In the center above the tabernacle is St. Bonaventure, patron of the mission. The church also highlights a shrine of Nuestra Señora de Guadalupe. Northbound: From US-101, take exit #70A/California Street. Turn left on E. Main Street. Southbound: From US-101, take exit #70A/Ventura. Turn right on E. Main Street. Monday - Friday 10:00a - 5:00p, Saturday 9:00a - 5:00p, and Sunday 10:00a - 4:00 p; closed major holidays. Please call 805-643-4318 for further information.